What trim level or etc dictated what cars got a dash clock ? It also depends on what year you're referring to. The above is correct, but only for 1969. If it came from the factory with U17 then yes. I can understand the potential confusion since half the cars on ebay are incorrect. The missing clocks with U17, the unpainted grill surround, and incorrect striping are running rampant these days! Very early press release photos show a '69 SS convert with U17 but no clock. Typically those were Pilot builds, not production cars. Early '69 Communication kits depicted a '69 Camaro dash with tach but no clock so a clock may have been a late addition to the option. Yes, I remember that from the early car mag roll out of new for 69 GM products. A few years ago I got to spend some time examining N500003, probably the 1st '69 Z/28. The dash cluster was hand-made. Never had a body tag; has a '68 style floor pan. Hope to see it again with a lot more lighting. Obviously a Pilot Car, hard to believe Chevy sold it. That car would keep me up at night. So cool. 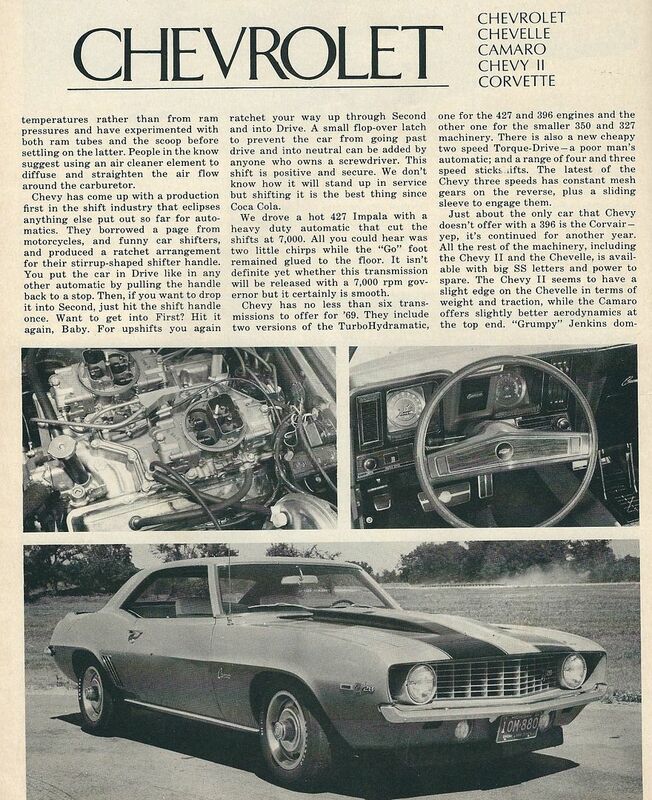 If Danny's freaking out because the picture of the car itself is a Z28 (and as we all know, you couldn't get an automatic in a Z28), it's because magazines typically use several different cars for their layouts. The pictures on that page are of at least two different cars, and maybe even three. And most likely the pictures were furnished by the Chevrolet publicity department. William could you please clarify how the '68 style floorpan' differs from the '69?